The ATEX directive controls the manufacturing and import of electrical equipment used in hazardous zone. Hazardous zone are areas with the presence of flammable gases, vapors and liquids in sufficient quantities to cause an explosion or fire. ATEX requires equipment to be safe and provided with labels/CE markings. Atex refers to two European Union (EU) directive, these are 94/9/EC and 1999/92/EC. Both of these are related to one another, 94/9/EC is the equipment directive and 1999/92/EC is the use directive. The equipment directive concerns with the manufacturers and Ex equipment while use directive relates to the classification of hazardous area. • Electrical equipment must have an ignition source. • Equipment’s should be specifically designed for use in an explosive atmosphere at normal temperature and pressure. • The atmosphere can have gas, vapors, mist or dust as fuel but should be based on air as oxidizers. Group I: Products to be used in gassy mines. Category M2: Equipment or system with high level of protection. They should be able to disconnect in the presence of gas. • Category 1: Equipment or protective systems with a maximum level of protection. • Category 2: Equipment or protective systems with a high level of protection. • Category 3: Equipment or protective systems with a normal level of protection. 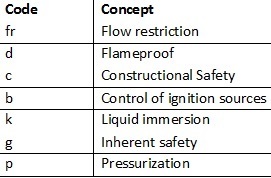 Each product will have will have atleast one explosion classification indicating protection concepts and approved environments. If equipment falls under more than one ATEX group, the explosion classification will differ. If equipment is certified with ATEX and IECEx there are additional explosion classification from IECEx scheme which are not part of ATEX system. • EEx– Product complies with an EN standard. • Q-“protection concept” is “power-filled”. 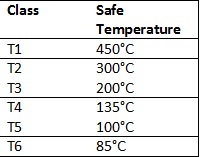 The maximum surface temperatures for equipment in ATEX explosion classification as a “T” value, ranging from T1 to T6 (T6 being the safest). ATEX mechanical protection is based on the risks and variability of a situation where equipment must be safe in normal as well abnormal work conditions. Mechanical protection concepts are defined in multi-part EN13463 standard; please see below for more information. ATEX directive allows manufactures to introduce innovation in products. After the designated technical and quality objective are met manufacturers is entitled to display a distinctive European mark. This symbol is recognized throughout the European Union.